February 23, 2009--National Geographic is pleased to announce that U2 3D received the award for Outstanding Visual Effects in a Special Venue Project from the Visual Effects Society of America on Saturday, February 21, at the 7th Annual VES Awards. National Geographic received this same award in 2008 for its production Sea Monsters: A Prehistoric Adventure. Taking home the award were Peter Anderson, Steve Schklair, David Franks and Jeremy Nicolaides. 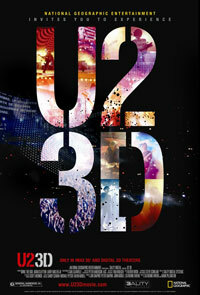 U2 3D, produced by 3ality Digital and distributed by National Geographic Entertainment, premiered in January 2008 as the first-ever live-action digital 3D film. Marrying innovative digital 3D imagery and multi-channel surround sound with the excitement of a live U2 concert--shot in South America during the final leg of their “Vertigo” tour--it creates an immersive theatrical experience unlike any 3D or concert film that has come before. With what became the largest collection of 3D camera technology ever used on a single project, the film’s production crew joined up with U2’s globe-trotting caravan for a month and shot the huge outdoor stadium shows (not seen in North America) at cities in four countries, including Mexico City, Mexico; Sao Paulo, Brazil; Santiago, Chile; and Buenos Aires, Argentina. the Los Premios MTV Latin America Video Music Awards; received the Pioneer Award (Film & Television) from the 2008 3D Film and Interactive Film Festival; and Best Film Produced Non-Exclusively for the Giant Screen from the Giant Screen Cinema Association. The film was the best reviewed concert film of 2008 and the fourth best reviewed film overall according to RottenTomatoes.com annual review round-up.